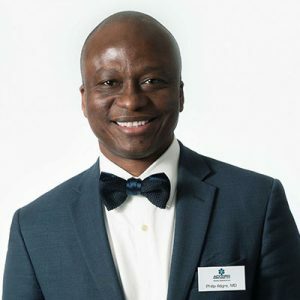 Dr. Philip Atigre of Accord Medical Group in Tampa, Florida is board certified in internal medicine. He was born and raised in Ghana, then received a grant to study in Cuba when he was just 13 years old. He became fluent in Spanish, finished his primary education, and went on to study medicine. In 1996, Dr. Atigre received his medical degree from the University of Havana School of Medicine and accepted a position as Lecturer of Medical Physiology at Spartan Health Sciences University in St. Lucia. A year later, he became the medical officer in charge of the island nation’s sexually transmitted diseases program. In 2005, Dr. Atigre completed his residency in internal medicine at the New York Downtown Hospital in New York City. Prior to moving to Tampa, he implemented the hospitalist program at Lakeside Memorial Hospital in Brockport, NY. Dr. Atigre offers superior primary care and preventive care services, integrating state-of-the-art techniques with proven traditional methods of treatment. In addition, he understands the unique health care challenges of older adults and is dedicated to treating chronic illness and the medical complications older adults often face. Dr. Atigre is known for creating long-term relationships with his patients. Dr. Atigre offers primary care physician services at our main clinic, assisted living or rehabilitation facilities, and hospitals. Dr. Atigre and his staff genuinely listen to your concerns and provide individualized care for your specific health care needs. When medical issues arise that are best handled in an inpatient or emergent setting, Dr. Atigre can treat and direct admit to St. Joseph’s Hospital Main, St. Joseph’s Hospital North, Kindred Hospital Central and Kindred Hospital Bay Area. Direct admission is an alternative approach to hospitalization where Dr. Atigre sends his patients to the hospital directly by our physicians when their health condition requires it. Dr. Atigre will follow your care while you are there and ensure that you receive appropriate care after you are discharged. Dr. Atigre was selected as a Top Doctor by FL Top Docs in February 2018. FL Top Docs in an EXCLUSIVE healthcare resource that reviews healthcare providers. Their selection committee reviews background information: education, training, malpractice & license background check, accolades /awards along with patient reviews. Based on their criteria evaluation, FL Top Docs has approved Dr. Philip Atigre of Accord Medical Group as a Florida Top Doctor.